And this was our first ever TYT communication—welcome to the world of internet journalism! Mr. Chariton further asserted that we had selectively edited the videos in our post to make him look bad. While we did take short illustrative video snippets from TYT and Mr. Smith’s online videos, we also provided web-links to the complete videos for interested readers (Example: Here is the full video of how they sample drinking water by scraping the outside of a sewer pipe!) Ironically, as part of his threats, Mr. Chariton sent us a web-link to an earlier TYT video news story, that selectively edited a phone recording of Dr. Edwards that was made without his knowledge. Rather than removing our post, which provides unambiguous insights to problems with TYT and Water Defense sampling methods and data quality, we have instead decided to reveal new information we have uncovered about another key concern. Specifically, the inherent financial conflicts of interest associated with Mr. Smith’s efforts in Flint and elsewhere. We then highlight TYT’s efforts supporting Mr. Smith while attacking the sound scientific work of EPA, Flintwaterstudy and others. The crux of our problem with Mr. Smith, is not only the improper sampling conducted as a representative of Ruffalo’s WATER DEFENSE non-profit, but that he is simultaneously an entrepreneur launching his AQUAFLEX Limited Liability Corporation (LLC) business in the midst of the Flint Water Crisis. Aquaflex is positioned to satisfy unmet needs for a water testing, filtration and remediation systems, as Mr. Smith and Water Defense continue to identify and diagnose water contamination sites. The AQUAFLEX investor pitch disappeared after we exposed it, but the businesswire press announcement acknowledging Mr. Smith’s work at Water Defense and at his Aquaflex LLC business is still online. We then inquired with Water Defense, as to whether the letter read online by the resident, actually came from Water Defense. Water Defense lawyers have now told us in writing, that the letter in question, was NOT from Water Defense. Which then raises the question: Who is the Mr. Smith who wrote the letter extolling the virtues of the expensive NLP filters with the junk science conditioner? Upon further investigation, we have now discovered that Mr. Smith is representing both the Ruffalo non-profit WATER DEFENSE and his Aquaflex Holdings LLC business in Flint. Below are two letterheads obtained from his correspondence with Flint residents. Note that Scott Smith Aquaflex Holding LLC and Water Defense have the exact same phone number—hence, it is not a case of two different Scott Smith’s. Rather, it is a question of when you dial that number, which Mr. Smith are you talking to? Is it the opportunistic entrepreneur/businessman or the representative of Mark Ruffalo’s non-profit? Confused? So are we. We have now asked Water Defense to clarify exactly when Mr. Smith is representing the non-profit and when he is representing Aquaflex Holdings LLC in Flint. We believe that this revelation, legitimizes our concerns about Mr. Smith’s conflicting roles. 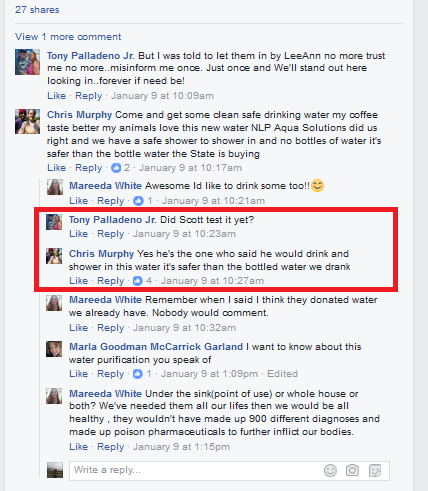 We further note that the resident in the social media video thought they were working with “Scott Smith of Water Defense,” yet Water Defense lawyers now insist they would never endorse filters and that the letter pushing NLP filters with junk science conditioners did not come from them. So maybe the letter, and the package deal for $11,300 per Flint house to have a bath he considers safe, is all the idea of Scott Smith of AquaFlex Holdings LLC. Which brings us back to the bizarre mutual admiration between Mr. Smith and TYT. TYT promotes Mr. Smith while attacking EPA, Flintwaterstudy and others, as evidenced by the following stories of Mr. Chariton over the last six months. Interestingly, while TYT has spent all kinds of air time questioning possible financial conflicts of real scientists working on normal research grants through their University and the ethics of EPA employees (and others) during the Flint disaster response, they have never once mentioned Mr. Smith’s venture capital AQUAFLEX Holdings LLC business venture. Nor have they commented on the quotation of $2,100 for Mr. Smith, as part of a $11,300-$13,800 package deal, to allow Flint residents to enjoy a Scott Smith approved safe shower. Oddly, TYT has never previously mentioned that Mr. Smith is also a businessman, self-identified entrepreneur, whose private company supposedly “Brings Clarity to Water Crisis.” No. Only his role at non-profit WATER DEFENSE has ever been discussed. This seems biased and one sided at best. Mr. Chariton is indeed a TYT political reporter and not a science reporter. We did not publicly respond for four months, while TYT shamelessly promoted Mr. Smith of AquaFlex LLC Holdings (or is it Water Defense?) at the expense of the EPA, Flintwaterstudy scientists and others. Because those attacks only hurt us, and not the public. However, once we determined that Mr. Smith was telling Flint residents, that the only way he could recommend a safe bathing experience in Flint, is after spending $11,300 per house, that crossed a line for us. His inexperience and bad science was then potentially hurting Flint residents, who have already been hurt enough. Ultimately, it is up to our readers, and the attorney general, to decide whether the $11,300 per Flint home was ethical or represents a good value. You can also decide whether TYT’s fawning coverage of Mr. Smith (and threats against us) represents good journalism. In closing, we would rather suffer the wrath of ”a public dispute with the largest online news channel in the world,” than sit by silently while bad science was used to hurt people. We called out EPA and the State of Michigan when they were the bad actors, and we will also call out TYT, a non-profit, and an opportunistic entrepreneur when they are in the wrong. So Mr. Chariton, we will not remove our posting — but we do provide your emails below to our readers, so your concerns and threats are faithfully represented. I think you should tweet this article to @michaelshure @johniadarola or @anakasparian as they are semi-reasonable members of TYT. Journalists shouldn’t be using Flint water crisis for their own personal brand development nor should they be threatening lawsuits they way this ‘reporter’ has done to you. Jordan Chariton is not what he appears, is he? Beneath that smiling exterior beats the heart of a mafioso. I’ve *NEVER* trusted Jordan Chariton. I wish TYT would just go away. @michaelshure @johniadarola or @anakasparian are all complicit in whatever threats Jordan is making. TYT are all hacks, they are all bought and paid for and none of them are truly interested in helping anyone but themselves and their own agenda. TYT is also dissing the lawsuit against the DNC, so they have gone over to the dark side. Marc & Siddhartha, the diversity of controversy and players that you continue to have to deal with in the aftermath of the Flint crisis must be nearly overwhelming. Is there some way of reducing the amount of your valuable time that these seemingly forever attention seeking and combative folks take by turning some of them over to some groups of students in a Communications (or other type) of class to monitor, triage, and be involved in studying and crafting responses to their ongoing antics?